York County was in the Canadian province of Ontario and was created in 1792. In 1816, Wentworth and Halton Counties were created from York County and in 1851, Ontario and Peel Couties were separated. In 1953, Metropolitan Toronto seceded. In 1971, the remaining portion of York County became the York Regional Municipality. A surety bond is a promise to assume responsibility for the obligation of a borrower. The person who provides this promise, is known as a surety or security. Bondsmen were usually relatives or family friends. John Patrick Treahy was born March 11, 1863 in Toronto, (was York County), Ontario, Canada or on March 11, 1862 in Woodstock, Oxford County, Ontario. He was the older son of Patrick Joseph Treahy and Eliza Mary Thomas. His brother was Bartholomew Thomas Treahy. In 1869 and 1870, he attended the School of St. Aloysius on Bond Street. The July 15, 1869 issue of The Canadian Freeman lists Master J. Treahy as one of the winners of "prizes for being good little boys." The February 28, 1870 issue lists his prizes as the 2nd prize for improvement in the 1st class and 1st in 2nd class geography. He came to California in about 1878 (32 years before his death according to his death certificate). That would have made him about 15 years old. A John Treahy appeared in the 1880 Langley's San Francisco Directory. He was a laborer working at the O. K. Foundry. He resided at 64 1st Street. In 1882 John P. Treahy was a molder according to the directory and resided at 306 Beale. He married Matilda Jones Shefeld in about 1883 when he was about 20 years old. Their children and life together are described in the John and Matilda Treahy Family section. John Patrick became a naturalized citizen of the United States on October 3, 1884 in the County of San Diego. In 1885, according to the General Land Entry file, he purchased 160 acres of land for $1.25 per acre for a total of $200.80. It was located on Township 14S, Range 3 West of the S.B. Meridian. He paid cash. Ellar McKellar and Warren A. Forster were witnesses. Ellar had known him for two years in August, 1885. In 1887 he was listed as a molder for the Standard Iron Works in the San Diego Directory. The 1900 census said he was an iron molder. In 1893-94 he was living with his cousin, Mary Elizabeth Treahy at 350 Tenth Street. In 1894 Standard Iron Works was hired to recast one of the large church bells at Mission San Diego de Alcala in San Diego. His wife, Matilda left, in about 1895. From 1895 to 1897 he was living with his cousins, Bert M. and Miss K. Treahy at 525 Milton Avenue. The 1904 San Diego Directory says he was the foreman for Standard Iron Works where he was still employed in 1906. During this time, according to Barry Treahy, John Patrick was instrumental in constructing the Foundry-cast ornamental lights on the Cabrillo Bridge. Repeating things from memory (third person) from the distant past can be a challenge. According to my father, he worked in the foundry that made the castings for all of the lights that exist on the Cabrillo Bridge. This bridge connects Balboa Park to downtown San Diego. . . It was constructed as part of the 1916 [Panama-California Exposition] world exposition that was the creation of all the neat and quaint buildings making up Balboa Park. He was an instructor at the Barth Polytechnic School from 1907 to 1909 which was located at 14th and Beech. I find in the minutes of regular meeting of February 4, 1898 the following statement: "A petition for the degrees was received from John Patrick Treahy, aged 34, a foundry foreman by occupation." The petition was referred to an investigating committee. Brother Treahy received his first degree on March 11, 1898; the second degree was conferred on April 1, 1898 and he was made a Master Mason on May 13th, 1898. He died on September 1, 1910 in San Diego. His grandaughter Nellie Long, wrote that her father died of Bright's Disease. He died on a convulsion. He was buried in a Masonic Service in the Masonic section of Mount Hope Cemetery, Lot 45, Grave 1. The expenses for his funeral included a $65.00 silver casket, a $10.00 hearse, an $11.00 burial robe, a $50.00 perpetual care lot, $12.00 for three carriages, $2.00 for funeral notices, and $15.00 for care of remains, grave digging, decorating and a tent. His will was probated in San Diego Case 4467. Lillie Treahy was the administratrix and Francis X. Wallace and Leo Dobler, his cousin's husband and son-in-law were the sureties. The real estate included lot 36, block 129 of the Manasse & Schiller Addition, valued at $1,200.00 and Lot 2, Section 19, township 14 South of Range 3 west S.B.M, valued at $400.00. He owed $31.00 to Hans Marquardt Dealer in fine clothing for shirts, a hat, and a suit purchased November 19 and December 22, 1909. In this city, Sept. 1, 1910. 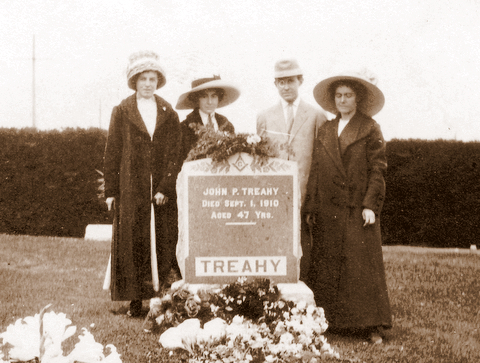 John P. Treahy, father of Mrs. J. D. Miller, Mrs. Leo Dobler, Wilbur J., Lillie Estelle and Jessie Bell Treahy, and cousin of Mrs. F.X. 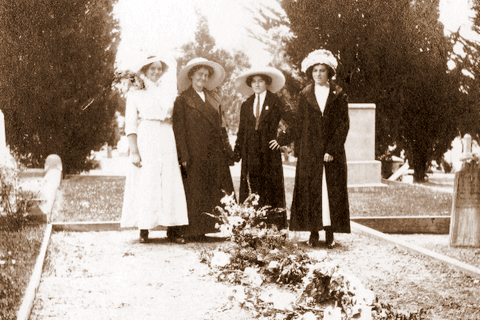 Wallace and Mrs. Charles Edsall of San Diego, and Mr. and Mrs. W. J. Flynn of Los Angeles and Bert Treahy of San Francisco, Cal. ; a native of Canada. aged 47 years 5 months 21 days. Friends and members of the Masonic order are invited to attend the funeral services at Masonic Hall on H. Street between Fifth and Sixth streets tomorrow (Sunday) at 10 o'clock a.m. under the auspices of Silver Gate Lodge No. 296 F. and A. M. Internment at Masonic cemetery. The Public Land Survey System is used to survey and spatially identify land parcels in the United States. Range is the distance east or west from a referenced principal meridian in units of six miles. A Section is approximately a one-square-mile block of land. There are 36 sections in a township. A Township is a parcel of land of 36 square miles or a measure of the distance north or south from a referenced baseline in units of six miles. A freemason (mason) is a member of an international fraternal and charitable organization pledged to mutual assistance and brotherly love. Nephritis is an inflammation of the kidneys. It can be caused by an infection, but is most commonly caused by autoimmune disorders that affect major organs. It was called Bright's Disease.